I'm off to New York for a week, so I've been thinking of diner breakfasts, bagels, smoky pretzels and of course cheesecake. You just can't beat a slice of really good cheesecake, can you? I'm gonna make sure I have some at Dean and Deluca, but even theirs can't be much better than this one. It was my dad's 70th birthday at the end of last month and my mum asked me to bake a cheesecake for his party. 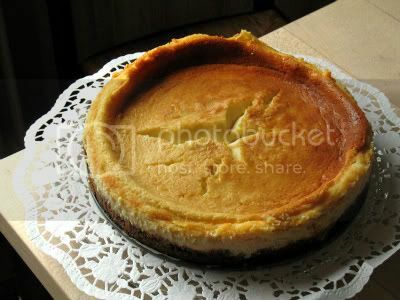 All my aunties were baking cakes as well and I knew that there'd be a lot of cake competition, but I had made this cheesecake before and knew it was good. I blame the cracked top on my mum's oven being different to mine (I like excuses), but it didn't really matter because the cake was just as rich and creamy as I wanted it to be and everyone that ate some seemed to enjoy it. Mix the digestive biscuit crumbs (make them by placing digestives in a food bag and bashing them with a rolling pin) with the melted butter and sugar. Spread over the bottom of a lined 10inch springform pan, making sure it comes up a little around the edges. In a bowl cream the cream cheese, sugar, and vanilla extract. Add eggs, one at a time and mix well. Add the cornflour, whipping cream and a pinch of salt. Continue to beat or about 3 minutes at high speed. Finally add the lemon juice before pouring into a prepared crust in your springform pan. Bake for 75minutes, until the mix has set completely and the top is golden in a 180C oven. Allow to cool in oven with door ajar for about one hour. Remove the cake from the oven and place on a cooling rack until it has reached room temperature. 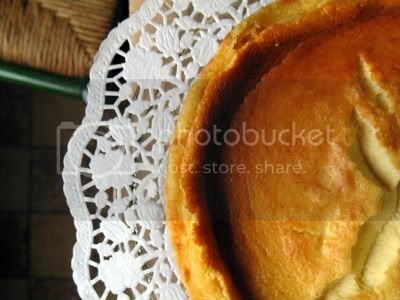 Place in the fridge for twelve hours before removing the cake from pan. The time of year where I crave comfort food, such as stews, soups, mashed potatoes and winter vegetables has definitely arrived. The days seem to be getting seriously short (which doesn't help the feeling that I am constantly trying to play catch up on things), most of the trees are bare and my selection of hats, scarves, gloves and mittens has been excavated from the depth of my wardrobe. Last week the wonderful people from Abel&Cole sent me some diced venison to try, because as well as the season for woolly jumpers it is of course also the season for game. I was really excited as it had been absolutely ages since I last ate venison. 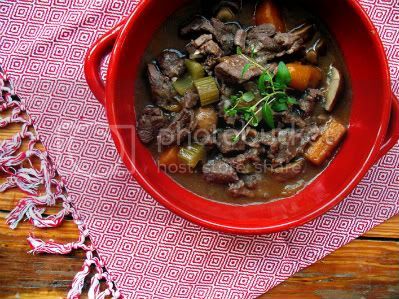 Some of my friends were a little disturbed by the thought of me eating Bambi, but JM and E were as excited as I was, so we had a wonderful Venison Stew on Sunday night. I served it with mashed potatoes and green beans and it was the perfect meal for a cold and dark Sunday night. If you, like some of my friends, don't like the thought of venison you can of course use beef instead. I forgot to buy bacon, so left it out and the original recipe called for roast chestnuts, but I'm not so keen so used chestnut mushrooms instead. Heat some oil in a heavy-based pan and fry the bacon until golden. Remove from the pan and set aside, but make sure you keep the fat in the pan. Brown the venison in the same pan. Fry it in batches to avoid the meat boiling in its liquid, rather than frying. Remove the meat and transfer to a casserole or pot with a tight-fitting lid, along with the bacon and any scrapings from the pan. Add the wine, garlic, onions, carrots and celery and increase the heat until the wine bubbles fiercely. Add the tomato purée, herbs and enough water to just cover the meat. Cover, bring to a simmer and cook for 2 hours in the oven. Check from time to time – if it’s dry, add more water and reduce the heat. After 1 1/2 hours (1 hour if using chestnuts), add the chestnut mushrooms and cook until the meat is very tender. If you want a thicker sauce, remove the pan from the oven, add some cornflour mixed with water. Place on the hob and bring back to a simmer stirring continuously until your desired thickness has been achieved. If necessary, season with salt and pepper before serving. I don't know where the days are disappearing to at the moment. I seem to be playing catch up constantly, at work, at home and with my blogging. I hope you won't give up on me completely! The weather has really turned now. It definitely feels like November, grey and very wet. Most of the leafs have come down now and I have to wear gloves and a scarf when I get on my bike to cycle to work in the mornings now, if I don't want to arrive with chaffed red hands when I get there. 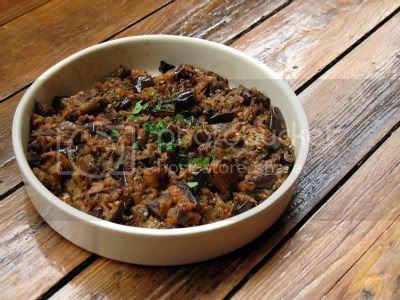 I'm in the mood for soup, stews and comfort food, but for now I've got another recipe from the dinner party a couple of weekends ago, a recipe for a Moroccan Aubergine Salad. I use quite a lot of aubergines in cooking and think they are a highly underrated vegetable. They are so versatile and taste great prepared in many different ways. This salad takes a bit of effort, but it is well worth it. Cut the aubergines into 1/2inch round slices. Rub each one with salt and place them in a colander for about half an hour, then wash off the salt and pat them dry with a kitchen towel. Heat some oil in a large non-stick frying pan and fry the slices (a few at a time) until golden brown on both sides. Remove them from the pan and rest them on some kitchen towel to absorb any excess oil. Leave to cool. Clean the frying pan, discarding all the oil. Chop the cooled slices coarsely and mix them well with the spices and garlic. Return them to the pan without adding any oil and cook them over medium heat. Stir frequently and cook until most of the liquid has evaporated. Place in a serving dish. Add the olive oil, lemon juice and salt and pepper to taste. Remove from fridge just before serving. Stir well once more and top with the chopped parsley.